High energy density utilizing dietary fat to improve palatability and reduce feeding volumes in inappetent pets. 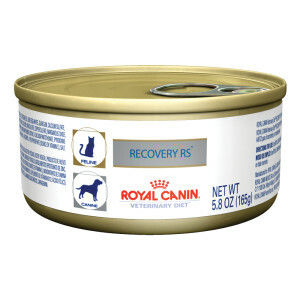 The Royal Canin Recovery Formula is designed for dogs and cats who are recuperating from injury and sickness. This pet food can be fed from a can or a syringe, and features high calorie content and digestibility to support your dog or cat when he needs it.